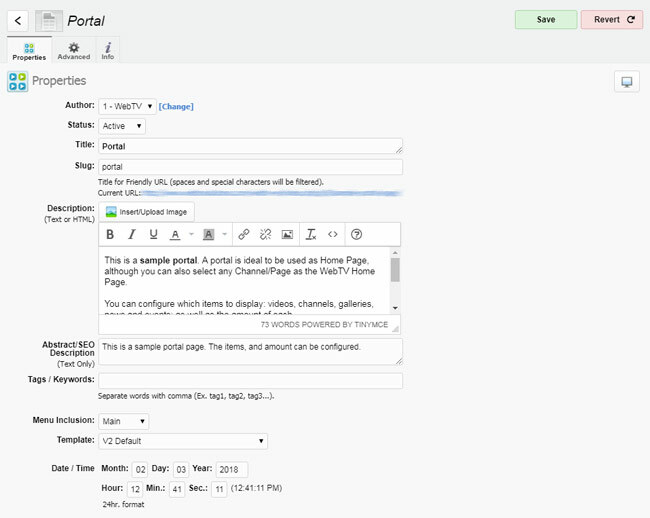 Step-by-step instructions on how to create a "Portal" Channel in WS.WebTV. A Portal is a special page which display an overview of the most recent WebTV content. It is ideal for creating the WebTV Home Page. To create a Portal click on "New..." button and select "Portal". To edit an existing Portal click the corresponding "pencil" icon. • Title: Enter a descriptive Channel name, as short as possible. The title will be used on the menus. • Description: (Optional) You can enter an introductory text here, if you wish. As you can see, we have included the popular TinyMCE editor that allows you to apply format to your content. • Abstract/SEO Description: This description will be used for SEO. • Tags/Keywords: Write some representative keywords for your Channel (comma-separated). • Menu inclusion: Whether to include the Channel in any of the WebTV's menus. • Template: Select one among the avilable templates for the Channel (if any). 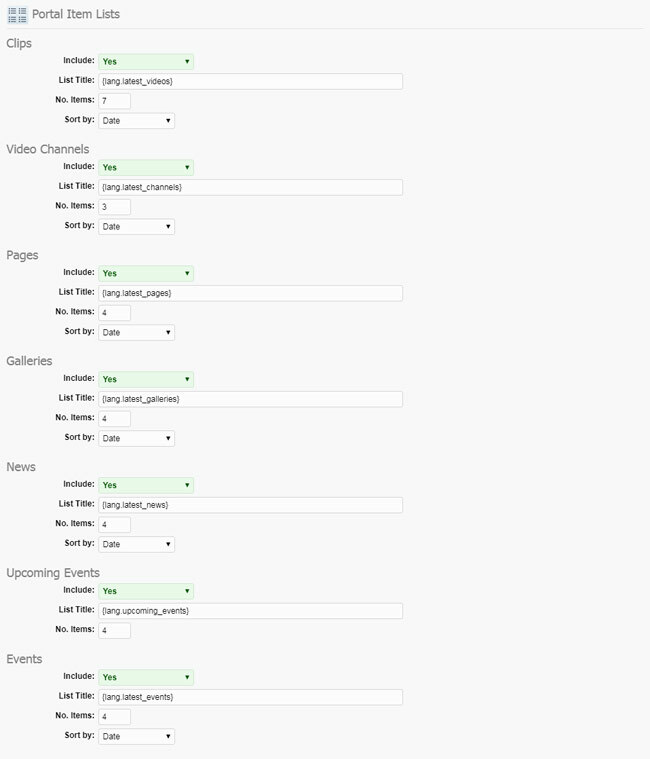 WS.WebTV can handle multiple templates for Channels. • Add item type prefix to titles: Select whether you want the system to prefix the item type to the titles. For example: "Video: Video title...", "News: News title..."
» Auto (Legacy): This is the old generation mode (for compatibility with versions prior to 1.7.5). The system will generate the slider using elements from the item list (from previous section). • Generate Slider from: Select which items should be used to generate the image slider. If you select "All" or "Clips+Channels", you can specify the total amount of items; otherwise the number of items on the item list will be used. » Auto (Selective): This mode lets you select the items to include in the slider. • Generate Slider from: Select the item types (which ones and how many - maximum amount) you want to include in the image slider. In this section you can add custom items to the slider and specify if the items should be inserted before or after the automatically generated items. To add items simply click the "New Item" button. In this section you can specify what items to include in the Portal item list. For each type you can specify the inclusion option (for example, only include "featured" items) the maximum amount, the title and the ordering. Once you are done editing the Channel, click the Save button. New Channels are inactive by default. In order to activate the Channel, return to the Channel list and click the "gray light bulb" icon (it will turn to yellow when active).